Rent for less than a hotel!! This two bedroom, two bath Ocean View penthouse is located in the middle of it all! Cross the street, and you hit the sand at Tamarindo Beach. Hear the waves crash from your private balcony! Luxury and convenience describe this wonderful condo located in the Sunrise gated community. This is the best location in Tamarindo and you are walking distance to restaurants, shopping, medical services and more, so a car is not necessary! This exclusive 1200 SF penthouse is nicely furnished and features a king-size bed in the master with private bath. There is also a twin bed and a double bed in the second bedroom with private bath. This home sleeps up to five in beds. The large, gourmet kitchen is fully stocked with all utensils and cookware, granite countertops, wood cabinets, stainless steel appliances and washer/dryer. Free Wi-Fi, local phone calls, Cable TV, and 24-hour security included in the rate. Daily maid service available for an additional fee. All linens are provided. Large televisions in living room and both bedrooms. Central air conditioning and ceiling fans in all rooms. Large, resort style pool with cascading waterfall and plenty of space to relax. We are here to help with your tour reservations, fishing charters, rental car reservations and offer private transport to and from the Liberia and San Jose International Airports for an additional fee. If you see that the dates you would like are booked, please contact us. We manage several properties in the area and may be able to find you that perfect vacation rental. Please let us know how we may be of assistance! Blue Water Properties of Costa Rica is a locally owned and operated company that manages fine homes, condos and villas for owners that live abroad. We pride ourselves in 5 star service and strive to make your vacation the best it can possibly be! 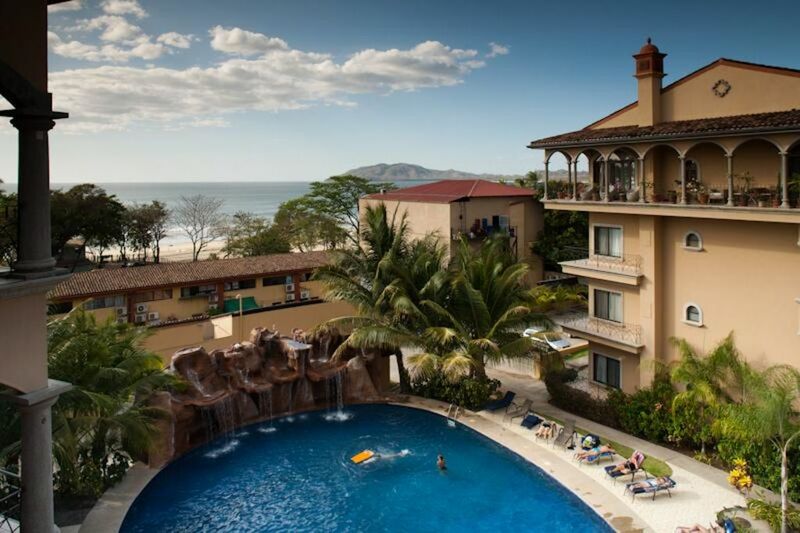 Great location for a 2 BR ocean view penthouse right in the middle of town and across the street from Tamarindo Beach! Featured on HGTV's new show "Live Here, Buy This". This was by far our best stay in Tamarindo...Great location in every way just a block from the beach, close to great restaurants, and the view from the condo is amazing! Some days we just went to the pool which was very easily accessed. We also had great service from the property manager and concierge. A perfect vacation! Will continue to book my vacations through Blue Water! The condo was in a great location. The pictures were accurate. very nice , we would recommend this to a friend. Outstanding location very nice unit very helpful concierge staff from blue water thanks Marcelo !! Thanks for your great review Doug ! We hope to have you back with us at Sunrise 12! We really enjoyed sunrise tamarindo, we were on the top floor with gorgeous views of the ocean ... The location is simply perfect, in the heart of town walk anywhere... The people are very happy and helpful... We would definitely come stay again.... If your looking to stay in sunrise u defiantly want third or forth floor for the views.... Pura vida! Great location, short walk to restaurantes and beatiful beaches. The appartment is very comfortable and well equiped. Staff is super friendly! Very well located and comfortable for our family of 3. Our grandson loved having a surfing beach across the way. We all loved being able to walk to restaurants and to the grocery store. The pool was beautiful and a good place to meet other families. Thanks for your kind review Deloris! I am glad to hear you and your family had a great time and enjoyed Sunrise 12. I hope to have you all as our guests in the near future! All the best, The Blue Water Properties team!